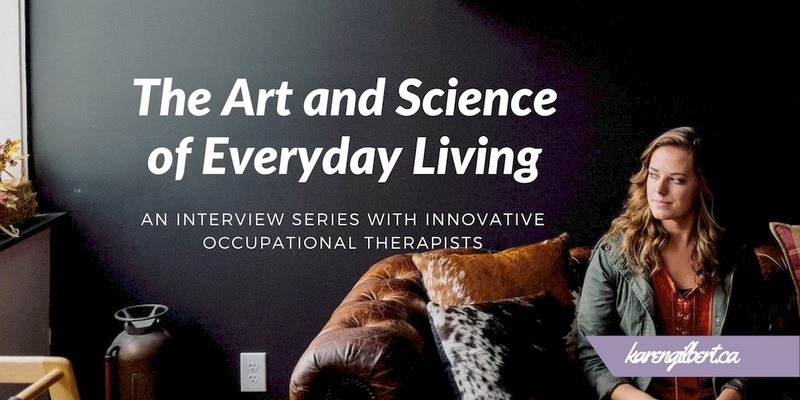 “The Art and Science of Everyday Living” is an interview series with innovative occupational therapists. Our next occupational therapsit brings a wealth of knowledge about Myalgic Encephalomyelitis or Chronic Fatigue Syndrome (ME/CFS), a complex physical condition that affects people of all ages and all walks of life. If you have an invisible health condition like ME/CFS, you may find pieces of your own story reflected in the words of the occupational therapists interviewed in this series. You may even find a tip or two to help you live your life with more ease, joy and meaning and foster a renewed sense of hope. 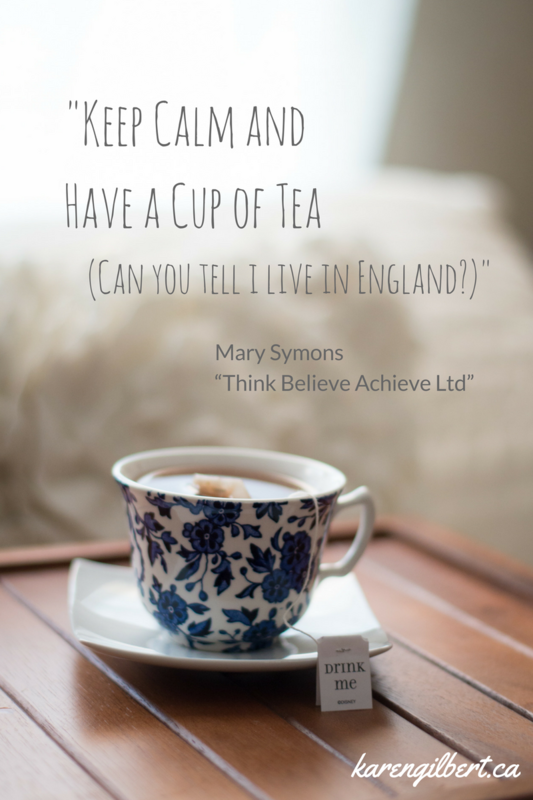 Mary Symons has been helping people achieve goals, overcome adversity and live the life they want since 2002. 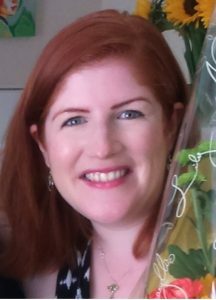 Through her company “Think Believe Achieve Ltd”, she provides private occupational therapy and life coaching in Hertfordshire, England. She specializes in neurological rehabilitation, with a special interest in acquired brain injury, stroke, chronic fatigue syndrome/myalgic encephalitis and chronic pain. Mary and I connected through the OT community on Twitter and I came across her video about online occupational therapy intervention for people with chronic fatigue syndrome/myalgic encephalitis/post viral fatigue syndrome. I am so grateful that she is here to share her insights with us. 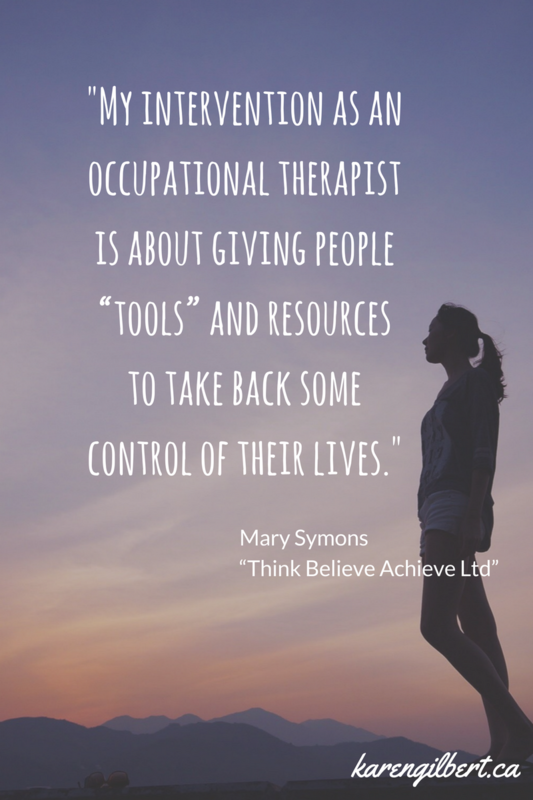 My intervention as an occupational therapist is about giving people “tools” and resources to take back some control of their lives. I firstly look at what a person is finding difficult. After this, solutions are explored to work towards the person regaining control of their lives after injury, illness or chronic health problems. The strategies used are specific to each person’s experience, lifestyle and goals. Occupational therapists have studied anatomy, physiology, biomechanics, neuroscience, psychology, medical conditions and ergonomics. This knowledge is applied to identify what each individual’s problems are. We use evidence-based knowledge, clinical skills and experience, to provide practical solutions and/or rehabilitation. Having occupational therapy in your day, helps you work, rest and play! I look at what each individual would like to get back to doing, and then plan on gradually integrating a number of techniques and strategies to their specific lifestyle. A lot of people want to work on promoting better sleep and learn mindfulness techniques as part of their plan. 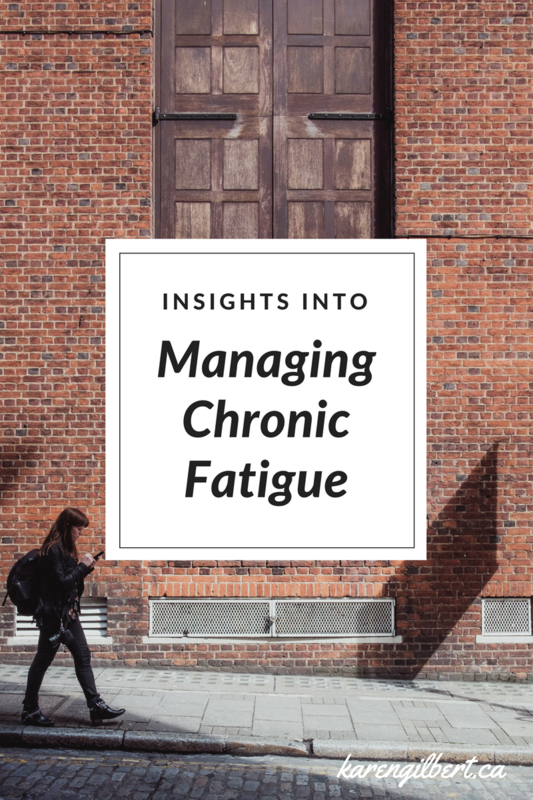 My intervention is based on; evidence-based practice fatigue management for in those with neurological conditions, what has helped me personally as a CFS/ME sufferer, and what has worked for others I’ve worked with over the years. Everyone is completely different in the severity of their symptoms and how the symptoms impact on their lives. I find that everyone (ideally) would like to get back to the lifestyle and energy levels they had before they fell ill. For most, that will be a very slow process, or just won’t happen, and this takes time to accept and adapt to. I’m here to make the situation more manageable with the benefit of having personal experience of overcoming this myself. Most of my clients have great ideas on what strategies/principles to use, but the ways they have tried to adopt these into their everyday life, has not worked for them. Having occupational therapy helps integrate strategies and techniques into their own environments and lifestyles effectively, not just for the duration of therapy, but for life! When I was first unwell in 2003, it took years to find what worked for me. I feel if I had received support from an expert occupational therapist when I was first diagnosed, I would have mastered managing my condition a lot sooner. I’ve collated bookcases full of resources over the years and I use many different sources of information. I definitely advocate learning as much about your condition as possible, but it depends on what problems each person has, to what I could specifically advise for books, websites and apps. But I’m happy to give recommendations to anyone emailing me a query. People appreciate that I get things moving in the right direction, understand each person’s priorities and that I look for a number of solutions to make life easier. Occupational therapy considers the whole person, environment and activities they are doing; which seems to encompass all parts of life! With a broad range of clinical experience and skills, I can assess and suggest solutions/techniques/treatments to manage many different difficulties. Latest evidence in how the gut and metabolic dysfunction contribute to the symptoms of ME/CFS. I feel that this will lead to breakthroughs urgently needed for people who have the most severe forms of this condition. I also hope it will raise awareness of this condition being treated as a metabolic/neurological condition by all medical and health professionals. I am also excited about the potential we now have to further develop existing technology to improve the consistency and intensity of rehabilitation to those with brain injury and stroke. In the future, therapists will still have a huge role to play in rehabilitation, but technology will be a great tool to enhance our interventions. Sleeping well, working, cooking, spending time with friends, dancing, creative writing, painting, comedy, playing music, and gardening to name a few! Listening to soothing music, smelling lavender, having a back massage. Do your best, have integrity and always be kind. I’m so lucky to have travelled to so many amazing places, met great people, and I’ve lived and worked in other countries. I would love to achieve a lot more through my therapy work, so watch this space! Help is out there, don’t ever lose hope that there are better times ahead. Thanks for these great posts. I have been inspired by the first two articles and plan to use some of the ideas in my own practice.